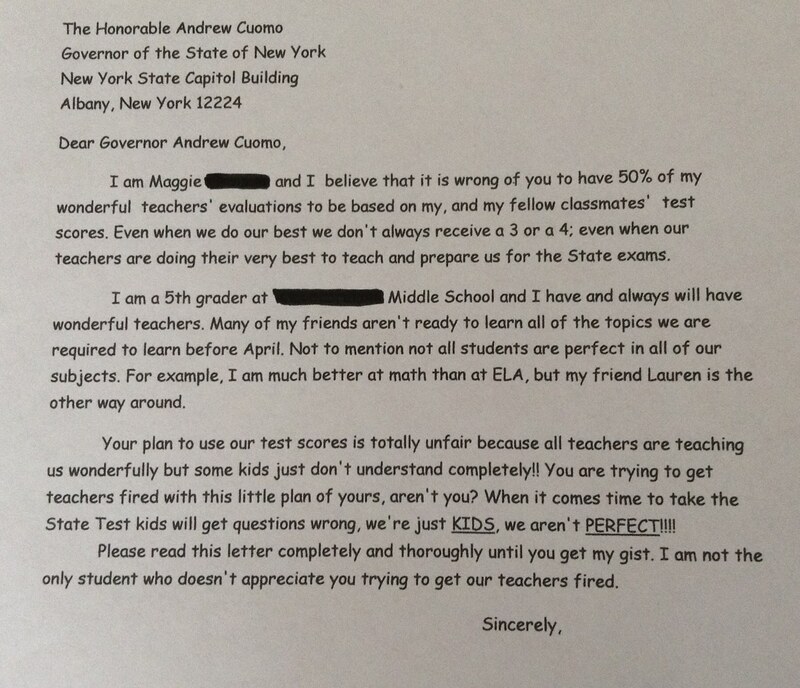 This entry was posted in call to action, education, Letters to Cuomo, parents, Student Heroes, student voice. Bookmark the permalink. Excellent student letter to Gov. Cuomo. I sincerely hope he reads all of the mail he is getting from students. it’s great, but it is obvious that this letter is not in her own words. She was coached. Like it or not, the blood sucking minions will figure it out too. I hear the STUDENT VOICE of a 10 year old loud and clear in Maggie’s letter. Let the haters hate but that is not going to stop our kids from SPEAKING OUT! From the mouths of children we discover how abusive the Common Core top down rank and yank testing agenda is. I am totally at a loss as to WHY so many people are determined to destroy the greatest gift we have given ourselves — education. It makes no sense and in the long run, the very people who are so busy advocating and bad system — one in which teachers can’t teach and students don’t learn — will pay the price with a under educated working population. Stupid stupid stupid.